Join us this week as we welcome the Indie Pop/Rock band, Night Lights. With members from Mexico, Japan, California, and Norway, Night Lights brings together an eclectic assortment of indie, rock, and soul influenced sounds in an effort to make people dance and feel feelings. The now LA based band met in 2012 while attending school in Boston, and has since discovered a balance between profound lyrics, hooky melodies, danceable music, and intriguing harmonic progressions. They are heavily inspired by the likes of Mutemath, Two Door Cinema Club, Friendly Fires, and Radiohead, yet they found their unique sound in their midst. The band's songs touch on the subject of existentialism and the confrontation of the self, hoping to discover a truth grounded in music, community, and conversation. Yusuke's hooky guitar riffs, Jeff's melodic bass lines, Dag's colorful rhythmic creations, and Mau's captivating melodies & other-worldly voice effects all come together to take you on an unparalleled audio adventure. 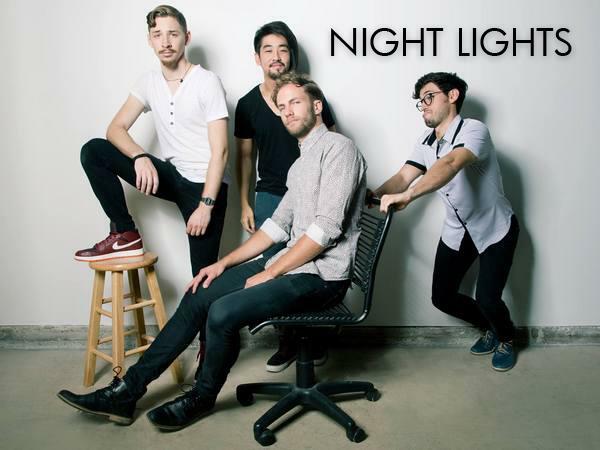 Night Lights released their indie pop/rock anthem singles "Childish," "Gimme," and "Take My Hand" in the winter/spring of 2016. Shortly after being released, "Childish," made it's way into both the Viral 50 Global and Viral 50 US Spotify charts, and has been played over 250K times on the platform. Night Lights is gearing up to release their upcoming EP, titled Expectations, in June 2016. We will talk to Night Lights about their upcoming schedule, get a behind their scenes look at their music, feature their latest songs, and ask them to share their message for the troops. Please be sure to visit The Night Lights at http://www.wearenightlights.com/ and spread the word. Fans are welcome to call in and speak live with them during the show (718) 766-4193. Our message to the troops: WE do what we do, because YOU do what you do.